People say they don't want it. But somehow, every year, the new installment of Activision's blockbuster FPS series winds up in their homes. 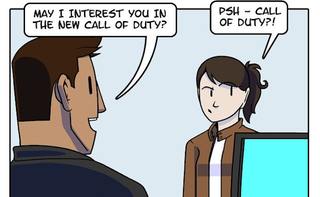 Dorkly's new strip about Call of Duty pokes fun at how complaints about annualized franchises can come from the unlikeliest people. He may be a jerk but at least the dude with the Affinity gamertag in Good Game's comedy sketch isn't exactly part of the problem he rants about. Guessing that he's not going to trade in Advanced Warfare, though.